All questions of given set is belongs to Indian ancient history gk quiz i.e. Ancient Indian Literature mcq. These educations quiz set is very helpful for all candidates who want to prepare for various competitive exams like UPSC, PSc, SSc, Bank Jobs, Railway, PSu, TET, CET, Vyapam, police recruitment test etc. I. The Atharva Veda basically consists of charms and spells that were prevalent at that time in the society. II. The Atharva Veda presents a portrait of the Vedic society. One can find an independent and parallel stream of knowledge and thought in the Atharva Veda. 1. Smritis dealt with the performance of duties, customs and laws prescribed according to Dharma. 2. Consists mainly of dialogues between the Buddha and his followers. 3. Select the correct statement (s) is/are correct about Upanishad philosophy. A) Indicates learning from a spiritual teacher. B) Indicates learning from best teacher. C) Indicates learning from best teacher who have morality and knowledge. 4. Which of the following is/are poetry and drama? 5. Which was the world- famous treatise of the amorous arts? 6. Which of the following Assamese literature is Buddhist songs composed in the 8th to 12th centuries? 8. Which ancient literature contains short stories that have the priceless treasure of morality and knowledge? 9. Which is a treatise on the science of governance? 10. Who among the following 8th century Sanskrit poet wrote Gandavadha which describes the exploits of Yasoverman (king of Kanyakubj) ? 11. Who among the following had written down the 'Ramcharita'? I. The ‘Puranas’ serves as a source of historical facts of ancient India. There are eighteen Puranas. They provide historical information of various dynasties. II. According to Dr. R. C. Majumdar, the war occurred in 1000 BC Apart from the Kurukshetra war, the Mahabharata contains various accounts of social life and religious thinking of the people of ancient India. I. Bal Gangadhar Tilak, on astronomical grounds, dated Rig Veda to .6000 BC to Harmon Jacobi, Vedic civilization flourished between 4500 BCand 2500 BC and the Samhitas were composed in the latter half of the period. II. Famous Sanskritist, Winternitz felt that the Rig Veda was probably composed in the third millennium BC. Which of the following statement(s) is/are not correct? I. Megasthenese wrote extensively in a book called 'Indica' which is no longer available to us. II. Megasthenese's writings could be seen through various extracts in the writings of Diodorous, Strabo and Arrian. III. Megasthenese mentions that Indian society comprised of seven castes (jatis). 16. Which of the following statement (s) is/are correct about Panini's great grammar the Ashtadhyayi? B) It was stated that with Panini the language attained its highest state of development and thereafter there was improvement only in its vocabulary. 17. Select correct pair of book and author. 19. Who among the following had written the ‘Rajatarangini’ which was the metrical legendary and historical chronicle of the north-western Indian subcontinent? 20. Which of the following statement (s) is/are correct about ancient Indian literature? A) The Puranas is important as they were the main influence in the development from early Vedic religion to Hinduism. B) The Shastras contained works of science and philosophy. C) The Bhagvad Gita a later addition to the Mahabharata enshrines a philosophical doctrine and in it are described the three paths to salvation: karma, gyan and bhakti. 21. Who has given the treatise on the rule of the Pandyan kingdom by Pandala a daughter of Herakles? 22. Who among the following renowned Scholar wrote the biography of King Harsha and Kadambari? 23. 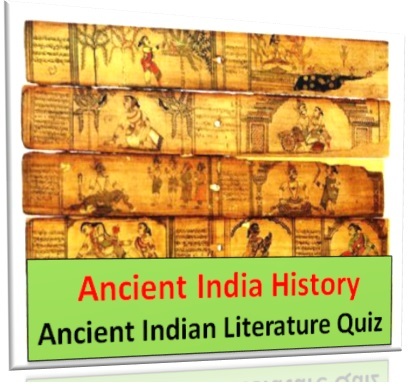 Which of the following Ancient Indian literature was a treatise on the science of governance? 24.Which of the following Sangam Text is the collection of 100 songs of VilambiNaganaar and deals conditions / emotions of 4 types of people who cannot sleep in the night and they are thief, lovelorn, after money, and worrying about losing money? 25. Which of the following Tamil literature was written by IlangoAdigal, brother of Senguvattan, a Chera King and who was a Jain monk is a highly regarded epic? 26. Which was/were the greatest poetry and drama work of Kaildas? 27. Which ancient account describes the Nandas expedition over all their rival monarchs that make them powerful rulers of North India? 28. Which Buddhist literature consists of dialogues between the Buddha and his followers? 29. Which of the following ancient treatise was the great Buddhist work consisting of dialogues between the Indo-Greek King Menander and the Buddhist philosopher Nagasena? 30. Consider the following statement (s) is/are related to the Smritis: I. It deals with the performance of duties, customs and laws prescribed according to Dharma II. It is concerned mainly with the rules of the organization of the monasteries. Which of the above statement (s) is/are correct?